We need diverse texts during content areas for the same reasons we need diverse texts in every other Our students need to feel represented - especially when we are teaching Science or Social Studies. Social studies, in particular, should not be filled with stories of white men and women. Whether we're reading biographies or historical fiction, we need to do everything we can to make sure our students see themselves in our lessons. When I look for texts that align with our content units, I purposefully look for books that represent as many groups of students as possible. The texts I'm showcasing today - What Can a Citizen Do? and Lillian's Right to Vote - are two that I would use with our first social studies unit on Government and Civic Understandings. They are filled with images and instances where my students can see themselves and still learn the content we need to master. A retelling of how the U.S. Constitution was written would've have worked great, but let's be real. How many of my students are going to connect with a text where the focus is on a group of old white men in leadership? Very very few. WHERE CAN I LOOK FOR TEXTS? Well, this post is a great start! I've joined The Reading Crew to bring you several new pieces of multicultural literature that you can bring in to your classroom today! 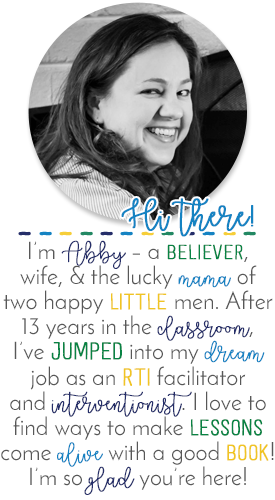 Even better --- we're all sharing a freebie for you to use as well! You'll find the complete link-up at the bottom of this post. I also follow the Nerdy Book Club blog (and on Twitter), I search random phrases on Amazon 😂, and I collaborate with my fellow bookworms all the time. Don't be afraid to dig deep in those Google searches, bookworms! TIME is not something we have a lot of as classroom teachers. Teaching across content areas is one of the biggest challenges I've faced in the classroom. It was also an area I found lots of success once I discovered how to connect the pieces in my classroom. When I brought mentor sentences into my classroom, I found that my students needed more practice than just the small lesson I was leading them in each day. I began to extend my lessons and add in a few additional activities to give my students extra practice during our Daily 3 reading centers. Soon, I was searching for texts that mirrored the concepts we were learning in social studies. I wanted to make cross-curricular connections to give myself more time to teach everything they needed. Towards the end of the year, I discovered Lillian's Right to Vote by Jonah Winter. Lillian's story is beautiful and I wish I'd found it sooner. Jonah Winter does a brilliant job of bringing all of the pieces in history together to communicate the importance of voting for Lillian to the reader. It also lent itself quite easily to an informational close reading passage that I wrote to supplement our social studies lessons. The sentence I chose was full of opportunities to discuss the different ways we use capitalization in our writing. This was the perfect skill for the beginning of the year when I would typically use this unit, or towards the end of the year when we need to review grammar rules for state assessments and we approach our civil rights unit. When What Can a Citizen Do popped up deeeeep in an Amazon search for kids' books on citizenship, I was beyond excited. Then my heart fell. It wasn't even out yet! This gem was published in mid-September, a few weeks after I really needed it. But when an amazing book falls into your Amazon cart, you go ahead and pre-order it! Dave Eggers has written such a beautifully simple message for our students - Be good humans. Be good to each other. If you can do that, you'll be a good citizen of this earth. In 40 beautiful pages, he manages to cheer on student activists, celebrate differences, and empower our young people with the will to stand up and do the hard work with us. While this book is fairly simple prose, it gave me a great starting point for writing an informational close read on what the right and responsibilities of a citizen are. In my state, that's part of our Government and Civic Understandings unit so I jumped at the chance to bring this book full circle. I also added a cloze activity to each book's companion unit and I'm excited to share one with you today! They are even differentiated!! I noticed that some of my attention-challenged children 😉 were taking a bit longer to complete these tasks. So, I reduced the numbers of words I expected them to "find" within the passage. Cloze activities typically use a reading passage students have seen before, with keywords and phrases omitted. The missing words are put into a word bank and students are asked to select the correct word to fill in a given blank. You can make your own cloze activities using a site like this one, or you can build your own in a basic document. You can choose to give your students access to the original text while they work, or ask them to complete it using only the word bank. Here are my 2 cents on that: When they are assessed with any kind of reading passage in "real life," no one ever takes the passage away. Why not let them use it?? Today, I'm sharing a close reading passage and it's cloze companion. Both activities come from my newest Social Studies Pop Up unit, The Rights and Responsibilities of Citizens. What Can a Citizen Do? is the mentor text, and I cannot wait for you to read it! To grab your freebie, click above! 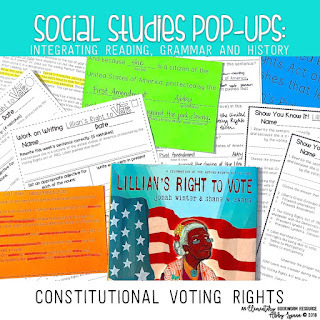 Check out either of my Social Studies Pop-Ups by clicking on either of these images as well! Don't forget to read through The Reading Crew's collection of diverse mentor texts. There are SO MANY of my favorites being share today - with freebies! Excellent post and amazing ideas as well. Thanks for these great book recommendations and resources that help students make important connections to their world! Good point about integrating diverse texts into all content areas. You've made me think differently about how I choose my resources! Thank you!